Summary：The economic downturn has sent many entrepreneurs in Ordos scrambling to repay debts by selling off their luxury cars. The city has unwittingly become a hotspot for car buyers in the region and even led some former energy industry businessmen to become used car dealers. These days you don’t see as many luxury cars driving around the streets of Ordos as you did in the past. But if you go to a used-car lot, you’ll see plenty. 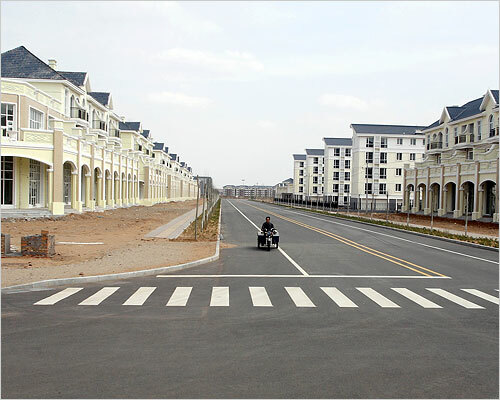 The city, although known as China’s largest “ghost town” for having scores of unoccupied real estate developments, is rich in natural resources like coal and natural gas. It was once teeming with entrepreneurs anxious to show off their wealth, but amid this year’s economic downturn, many are tightening their belts and selling their high-end vehicles off to the city’s second-hand market. This has drawn many out-of-town buyers and prompted people like former “coal profiteer” Xu Wenbo (a pseudonym) to switch trades in order to capitalize on the emerging used car market. Xu, from Ulanqab City, Inner Mongolia, has helped many executives purchase used cars in Ordos since October. He gave up the coal game after business slowed significantly this year. He says it was a natural move, since he has a good eye for cars. Indeed, he just closed a deal on a second-hand 2010 Toyota Land Cruiser in good condition for about 110,000 yuan. The price for the car when brand new was about one million yuan. Dealers like Xu learn about vehicles’ functions and negotiate the price, acting as agents between out-of-town buyers and second-hand car companies. But normally the process is pretty quick. “Often when a second-hand car like a Mercedes-Benz, BMW or Audi comes out, it’ll be picked up before very long,” said a manager with a used car company surnamed Zhou. Xu says that the second-hand cars in Ordos are cheaper than just about anywhere else. Currently he knows of a Toyota V8 available for 760,000 yuan, down from its original price of 1.8 million yuan. Then there’s a Toyota Land Cruiser Prado, originally 1.3 million yuan, now just 260,000 yuan. No customers have bought these cars yet so Xu is considering buying them himself and then driving them back to his hometown to re-sell. Manager Zhou says that in addition to the price advantage, Ordos also has an enticingly wide selection. Enthusiasm for cars, especially off-road vehicles, in Ordos surprises many people. After getting rich, locals don’t pay so much attention to food, clothing or housing, but when choosing a vehicle, they’re very picky. Even for farmers and herdsmen who get rich through land compensation, it’s said that if they have one million yuan, they’ll spend 800,000 on a car. Ordos’s real estate market flourished by relying on private funds, but that market went south after housing regulations went into effect. In order to get quick cash, owners of luxury cars have slashed the price when selling to second-hand buyers. An EO reporter met a number of local private entrepreneurs who confirmed that in the last two months banks in Ordos stepped up efforts to collect debts. Those who don’t pay up will be reported to the police. “People are all looking for money to repay the bank’s loan,” said a real estate developer who wasn’t willing to give his name. Since October he and his business partner have been desperately trying to find money while their business operations have basically stopped. A few cars at his company have been sold cheaply to repay debts. Coal mine owner Qi Dong (a pseudonym) told the Economic Observer that luxury cars are indeed disappearing from Ordos’s streets because they’re being sold or used to repay debts, but some are simply being hidden. There’s a rumor circulating that a creditor recently saw a borrower with outstanding loans driving a nice car, so he walked up, pulled out the keys and took the car on the spot. Stories like this, true or not, have scared some debt-ridden drivers into leaving their cars in the garage. Ordos has tried to transform its economy, which relies heavily on coal. In 2010, Hu Chunhua (胡春华), party secretary of Inner Mongolia, said that Ordos should accelerate the development of non-coal industries. However, this transformation has required huge investment and borrowing, and the results have been slow to come.